A unique guide written for the chemist who is planning to use or is considering the possible use of supported reagents, an application with great growth potential in the near future. Using practical examples of methods of supported reagent analysis, this comprehensive reference source also contains useful references detailing the best techniques to apply to particular problems. The authors discuss the many choices available in the preparation of supported reagents, including loading, support, method of preparation and activation, as well as covering the various analytical techniques to apply to solids. They also use numerous examples of supported reagents and their use in organic synthesis, emphasizing practical aspects. Chemists in catalysis, organic synthesis, analysis and materials science will obtain enough information to make use of these essentially simple but fascinating materials, which in a little over twenty years have matured from academic curiosities to important industrial materials. 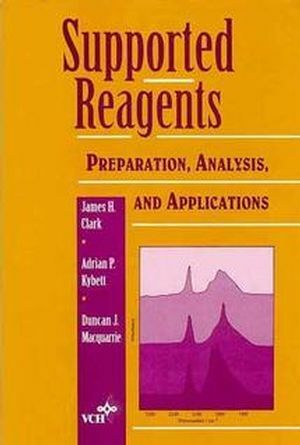 James H. Clark is the author of Supported Reagents: Preparation, Analysis, and Applications, published by Wiley. Adrian P. Kybett is the author of Supported Reagents: Preparation, Analysis, and Applications, published by Wiley.